Cambodia is one of the poorest places I’ve ever visited. Early on in my trip in Siem Reap, I met an Australian couple who ran a bed and breakfast near the inn where I stayed. I’d gone there for their fresh baguettes and cheese, which made for delightful lunches, but I wound up talking to Bob during my second lunch. “What brought you to move to Cambodia?” I asked him. I was stunned. “That’s amazing,” I murmured. “Absolutely,” I said. I bit into my sandwich and tried to ignore the lump forming in my throat. Having just left Korea, I thought back to how even my elementary aged students had their own cell phones, and they spent the little free time they had playing Angry Birds. I was still in Asia, but it felt a world away from what had become the norm for me. I dug into my money pouch and pulled out $20. I walked over to Bob and handed it to him, explaining that it was a donation for the school. “Thank you so much! That’s really kind of you,” he said. 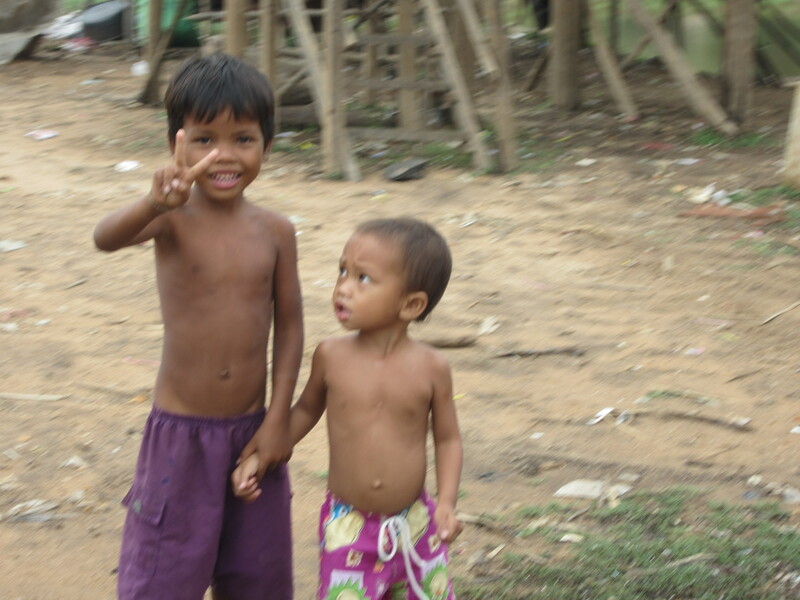 Many people in Cambodia were in need and begged for money. That morning, I’d seen a little girl begging for food, and a generous foreigner followed her into the grocery store and bought the baby formula that she asked him for. This, I would later learn was a scam. She would later sell the formula back to the store and split the $15 with the store owner. When handing my money to Bob, I felt confident that it would fully be used in the right way, but I felt simultaneously better and worse after doing it. I liked giving right to the source of aid, but I also felt selfish and over privileged myself. After all, the focus of my trip had been visiting spas for cheap massages, and touring the temples and ruins. Handing over some cash to a do-gooder felt like the easy way to boost my own ego. “Aw, I can’t have any then.” He pointed at his teeth. “These are all false, they’ll come right out. I smiled. He was the first person I’d encountered who said no to taking candy from a stranger. 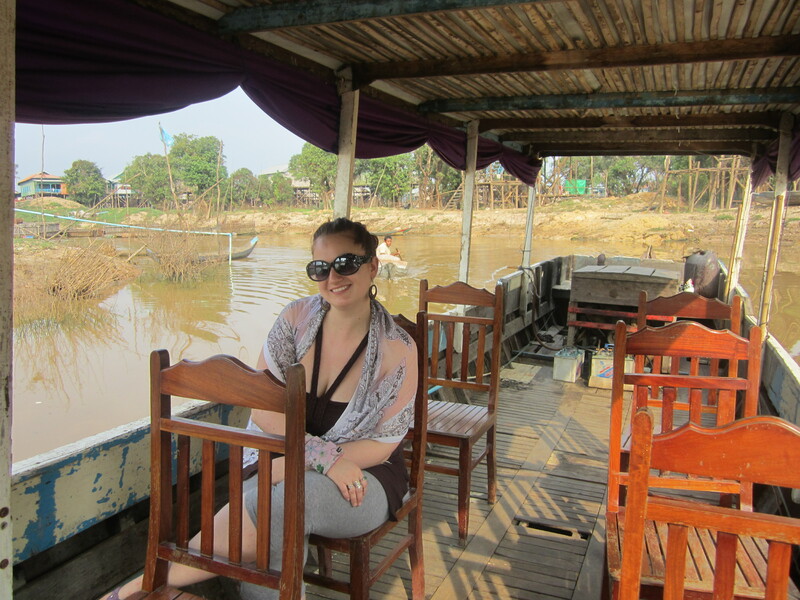 The next morning I woke up early to go on a tour in Kompong Phluk, also known as the Flooded Forests. Basically, as Cambodia rains more than three times as much in October as it does the rest of the year, the locals have to be prepared for flooding, and they are. I was the first tourist of the day, so for most of the morning I was the only white person in sight. Some people stared at me as my boat floated by, others waved, but most people continued on with their daily life, familiar with tourists and used to ignoring them. However, I was fascinated with the sights. 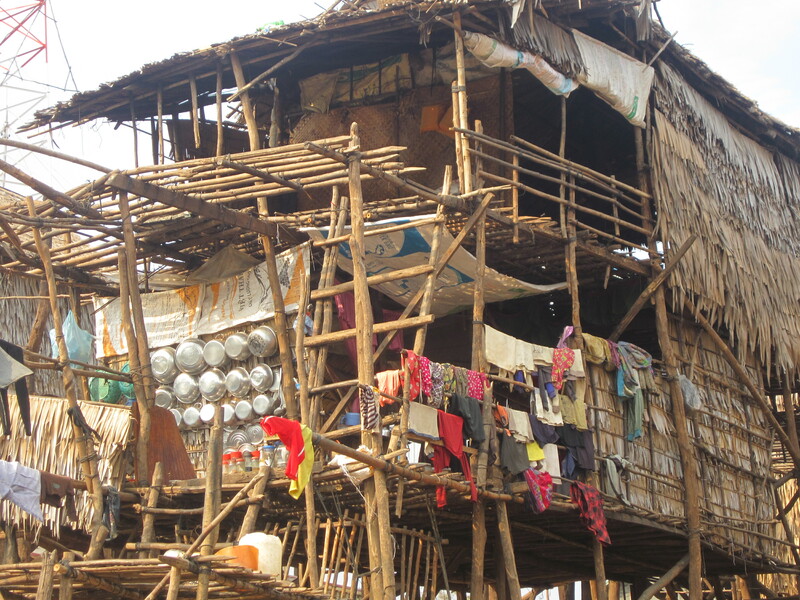 Houses built on stilts towered above me, looking rickety but clearly sturdy enough to withstand heavy rainfall. 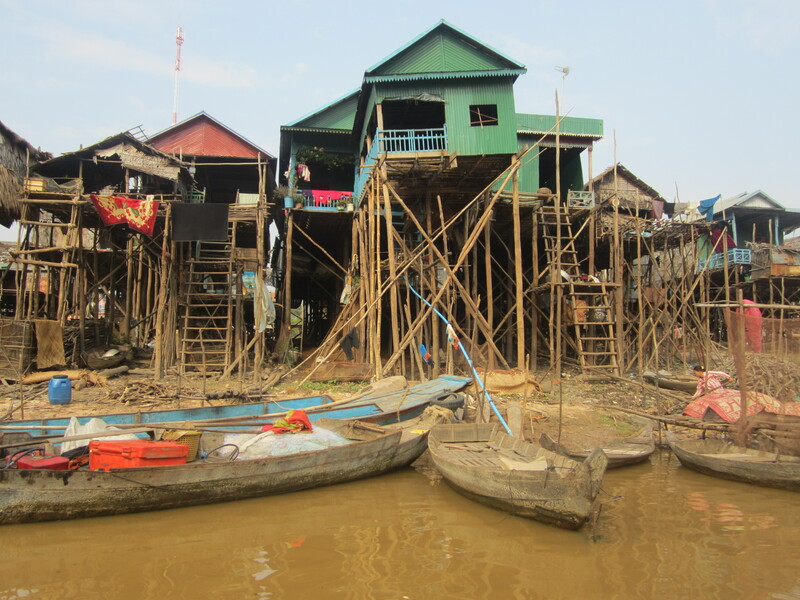 I was there in dry season, so I could see the base of the stilts anchored in the land, but I could imagine them disappearing into the murky water as well. We followed the natural turns of the river passing by countless men, women, and children riding low narrow canoe-type boats and fishing with big nets. Soon the river poured us out into a massive lake. We turned around and started back the same way we’d begun. Australian Bob had recommended this tour, and he’d advised that I stop at the pagoda and walk around. My tuk tuk driver Dara was riding in the boat too, and I asked him to check with the boat driver about visiting the pagoda. The driver nodded. 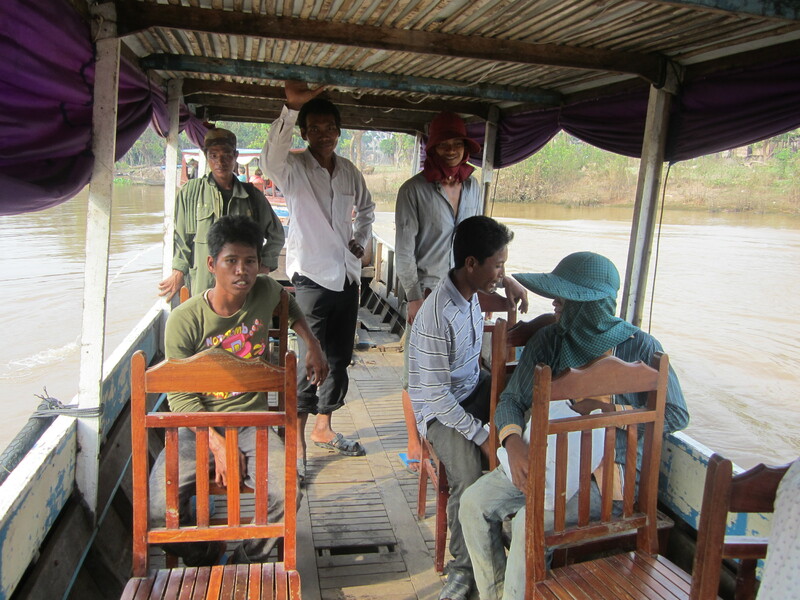 Before we got to the pagoda, he steered the boat to the shore and picked up six locals. They stood behind me, leaving all the seats in the boat vacant. I gestured that they sit, and a few did. We’d become a boat taxi. I kicked myself for traveling so lightly. I didn’t have any candy with me to share. We reached the pagoda moments later and I climbed out of the boat and up the cement stairs. 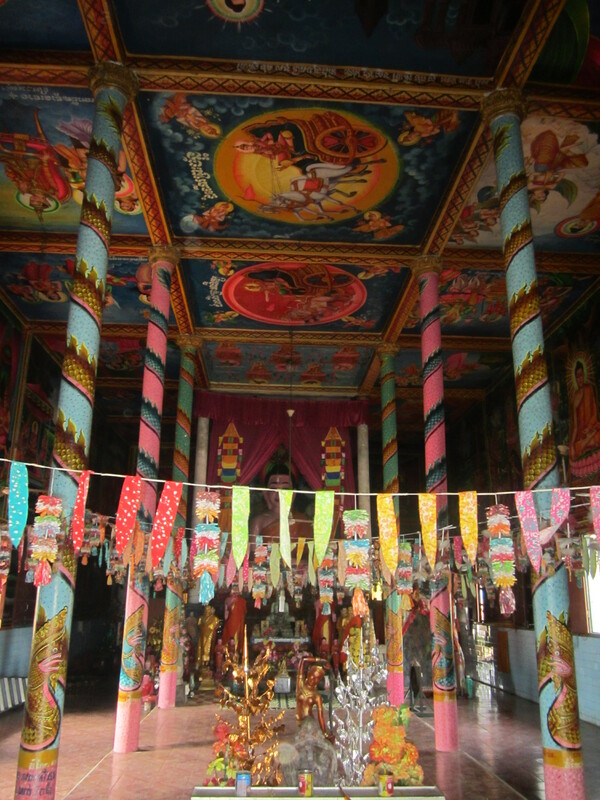 The walls and ceiling in the pagoda were covered with vibrant murals, and bright flags ran in a zig zag pattern from the doorway to the back wall of Buddha statues. Through the open windows I could see children in uniforms playing outside. I hadn’t realized I was near a school. Though I probably could have bargained her down, I didn’t bother. The thought of experiencing this kind of giving firsthand was an easy bait for a sucker like me. I handed my money over and followed her to a classroom. The children were tiny, and they all quit wiggling and stared at me when I entered the room. I un-rubberbanded the pencil bunches and walked up and down the aisles, letting each child choose a pencil. Dara had joined me, and he also went around handing out notebooks. Each child pressed his or her hands together in a prayer-like position, bowed, and thanked me as I walked through the room. Though this was clearly a tourist trap- and a successful one at that- I felt so much more fulfilled after seeing each grubby set of hands reaching for the pencils. Every poor country should be so lucky to have tourist attractions near their schools. Far more donations would be made this way. We waved goodbye and left, climbing back down the stairs and into our boat. I took one and started chewing. It felt chalky and stringy, but sweet juice leaked out as I bit down. “I’m a panda,” I told him. I wondered how I was going to swallow it, when I saw him spit out the chewed up remains. I followed suit. 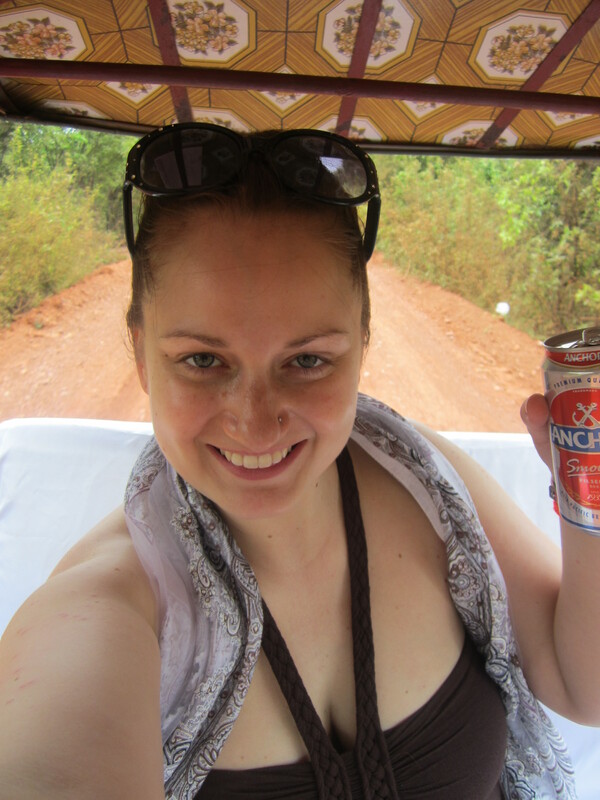 I climbed into the tuk tuk with my beer half-drunk. I’d seen a sign for a crocodile farm on the way in to Kompong Phluk, and I asked Dara if we could stop there on our way back. 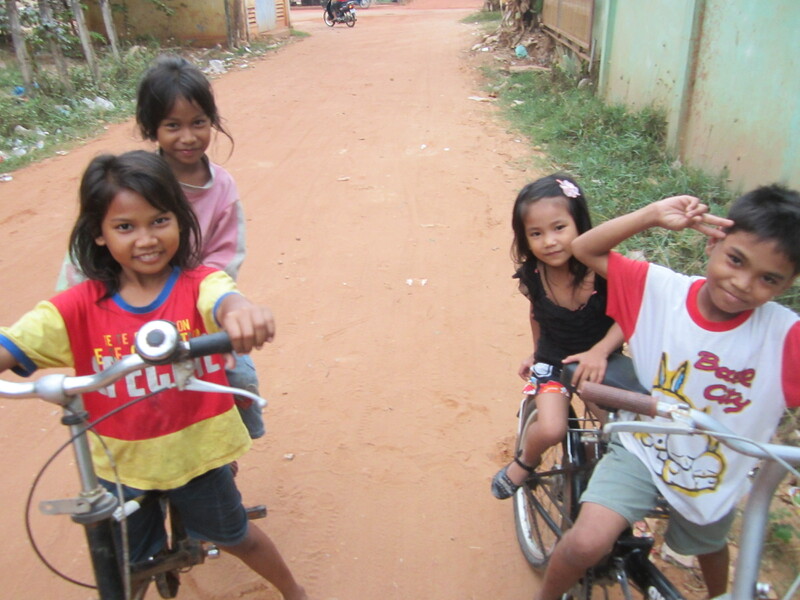 Many people who travel in a gritty place like Siem Reap explore by booking packaged tours. I liked making my own adventure, and doing it at the time of day when most tourists were having breakfast. 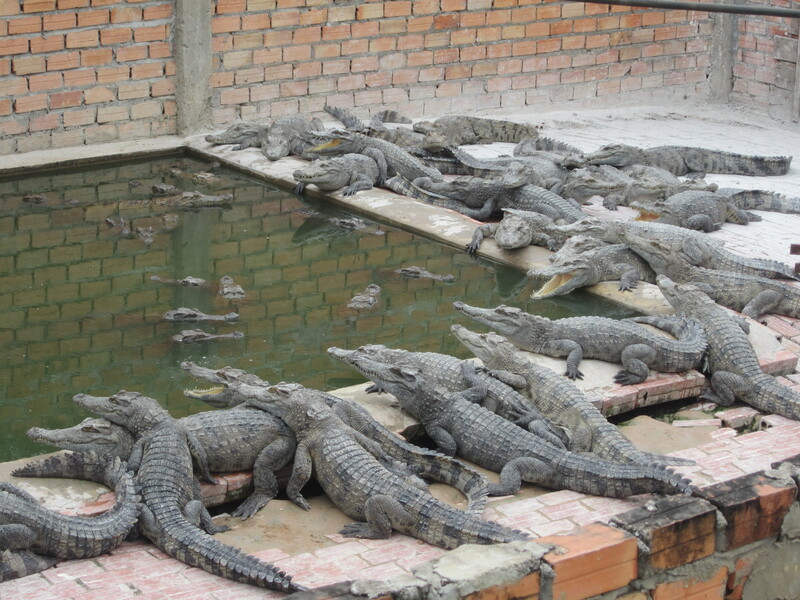 When we reached the croc farm, we were again the only visitors. I paid admittance fee for both me and Dara (after all, he’d bought me a beer, and it was only two dollars each) and we entered. The woman who took our money was clearly the owner, and the mother of three children who were playing beside her. 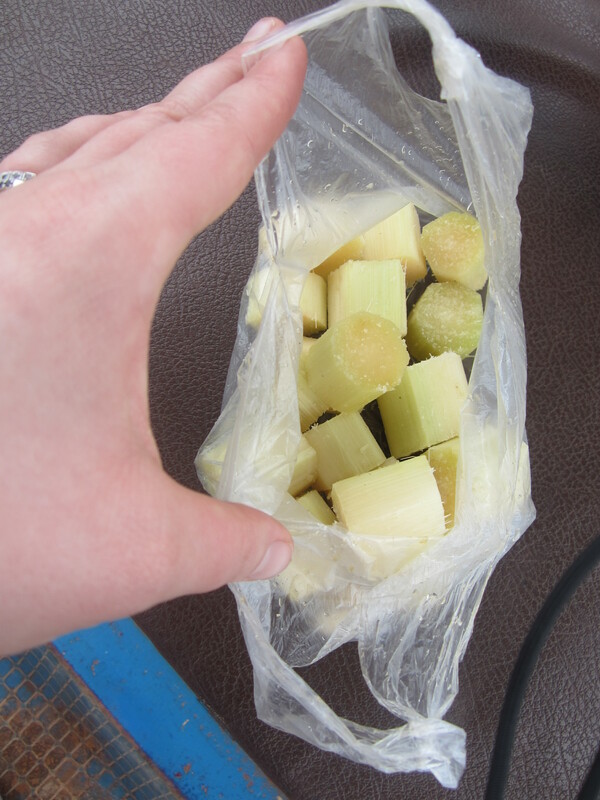 Dara handed them the bag of bamboo, and they eagerly reached in. 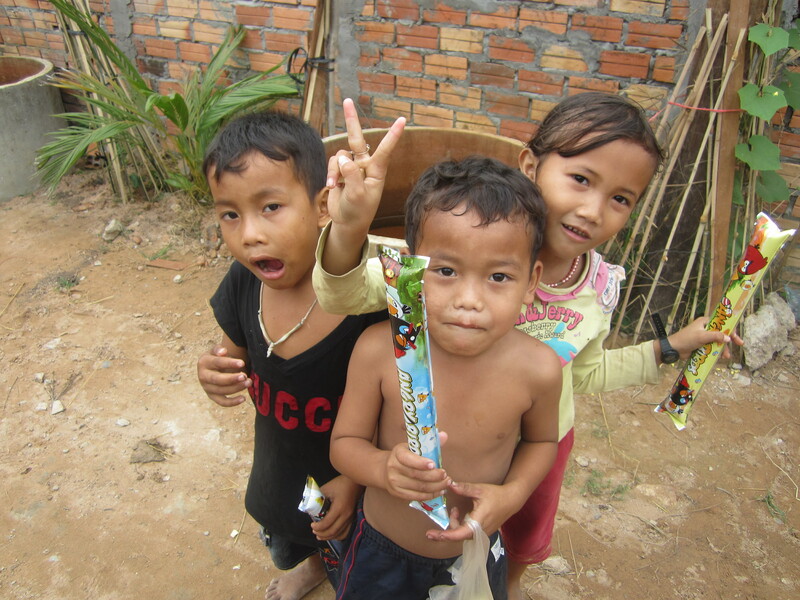 He was a candy-giver too, in a Cambodian way. He went to find the bathroom, and I turned to follow the kids. “Let’s go! Let’s go!” One boy sang, wiggling his hips. The other children laughed. “Let’s go! Let’s go!” I repeated, wiggling my hips too. The children roared. “Do you know ‘follow the leader’?” I asked. “Walk like this.” I started marching, and the children copied. “Now like this!” I spun around and shuffled backwards. They copied. We swung our arms, bobbed our heads, skipped and hopped around. Dara caught up to us as we reached a small area for baby crocodiles. The youngest boy hopped over the wall with no hesitation, shoved his hand into the water, and pulled out a baby crocodile. It squeaked as he carried it over to show us. Then we continued on up some stairs to look down at the larger crocs, all about eight years old. We were on a narrow walkway. To our left was a pool filed with massive crocodiles, and to our right were sandy pits where the crocodiles slept. There was no railing or wall to prevent people from falling into a sand pit, where they’d be ground level with a pool full of sharp-toothed reptiles. However, these kids were oblivious to any kind of danger, and continued to look at me, hoping I’d lead them in more silly walks. “Five, six, seven, eight.” I corrected. “One, two, three, four, five, eight!” He repeated. I’ll make these kids learn, I thought. I started another silly walk and the kids, delighted, copied. This time I counted up to eight as I did, changing to a different walking style with every new round of numbers. 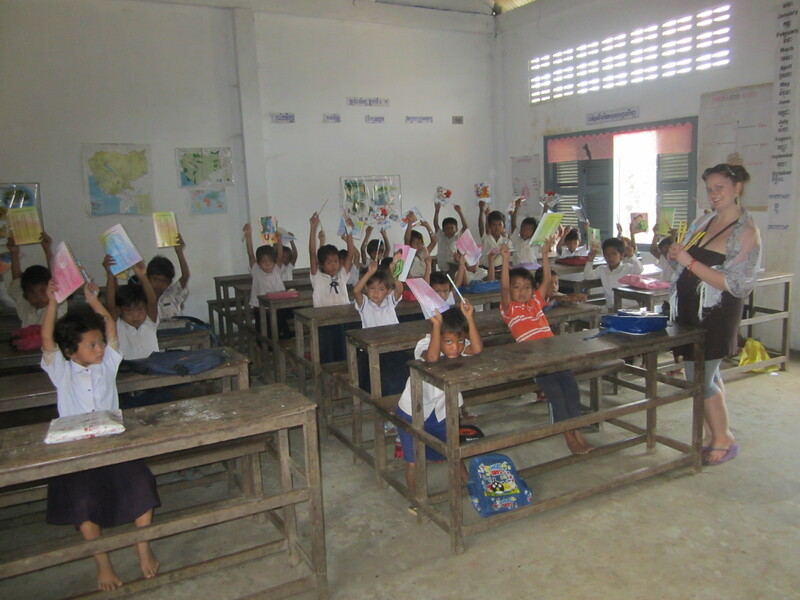 The kids counted with me in English, effortlessly learning. As Dara and I left, we high-fived the children. They were still counting and jumping with glee. It was better than giving out candy. It was better than giving out pencils. Most of all, it was fun for me as much as it was for them. wow!!! seems like ur getting all ur stress out from work!!! I hope that lady doesnt take those pencils n notebooks away from those kids after u left..
oh.. anna to be honest.. it feels soooo weired to see your house w no light!!!!! cime back!!! haha i know u wont! enjoy n get the most of it!!! Love reading your blog. What is the name of the Australian owned Bed and Breakfast in Siem Reap? Interested in connecting with the owner to help out at the school. Safe travels! Thanks for reading! The contact info email is ourbestwesternguesthouse@gmail.com. They would love volunteers, and if I’d had more time there, that’s what I would have done!